"PAV DHARIA" We all are familiar with this name, some of us know him for his music, some love his vocals while some are fan of his direction. 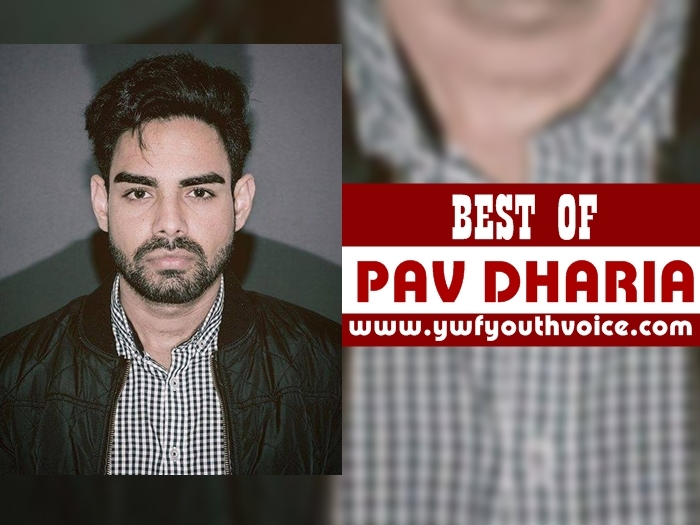 Pav Dharia is an fully packed package with brilliant skills and talent. He is an out of box artist, his work is completely different not just from other artists but also from his previous works, this is what makes his fans super excited whenever they hear that Pav's new music video is coming. He never disappoints, he always delivers quality stuff with original ingredients of his own. Here we present you our personal favorite music videos from Pav Dharia's discography till now, after listening this you'll surely listen Pav Dharia's all songs in future for sure. "PAV DHARIA" We all are familiar with this name, some of us know him for his music, some love his vocals while some are fan of his direction. Pav Dharia is an fully packed package with brilliant skills and talent. He is an out of box artist, his work is completely different not just from other artists but also from his previous works, this is what makes his fans super excited whenever they hear that Pav's new music video is coming. He never disappoints, he always delivers quality stuff with original ingredients of his own. Here we present you our personal favorite music videos from Pav Dharia's discography till now, after listening this you'll surely listen Pav Dharia's all songs in future for sure. Download Pav Dharia all songs 320 kbps mp3, itunes m4a, pav dharia all HD Music Videos, Pav Dharia Punjabi Sad Songs, Pav Dharia Best Punjabi Artist. Not able to view video? Click here to watch on YouTube. Wanna listen more? Click here to listen to YouTube playlist of Pav Dharia.